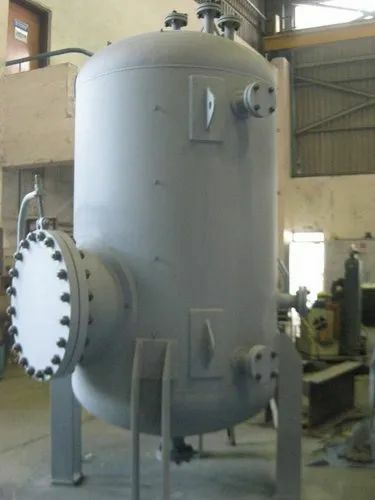 We have marked a distinct position in the domain by manufacturing and supplying the finest quality MS Pressure Vessels where we prove ourself with Errection, Commisioning with Water Circulation pipeline, Oil Circulation Pipeline and Steam Line. These vessels find their wide usage in refineries to hold liquids or gases at a pressure substantially different from the ambient pressure. Following the set industry standards, these vessels are manufactured by our skilled professionals using qualitative raw material and newest technology. Additionally, our quality experts strictly test these vessels against different quality parameters to remove all the faults. We offer these vessels in different specifications at market leading prices. Incepted in the year 1997, “Tech-Well Engineering Co. Pvt. Ltd.” is located at Bhosari Industrial Estate, Pune (Maharashtra, India). Our product array comprises LPG Road Tankers, LPG Storage Tanks,Propane, Pentane,Propylene, Ammonia Sulphuric Acid, Diesel, Petrol, Road Tankers, Heavyweight Bridges(Approved by Chairman Consumer affairs,New Delhi & weight and measure department,Maharashtra State), Electric Operated Cranes, Sugar Plant Machines, Turnkey Plant Equipments, Allied Machinery Spare Parts, Pressure Vessels and Heavy Fabrication Equipments. We have all types of manufacturing facilities with own design, quality & production. We have a wide range of equipments. These products are widely appreciated for their precision functioning, optimum performance, high efficiency, long functional life and sturdy construction. The raw materials used in the production of these are of high quality and is sourced from the reliable vendors in the market. The products manufactured by our organization find their application in various industries. Moreover, our company has hired an efficient and highly experienced team of professionals. We are also engaged in manufacturing of L.P.G., Propane, Pentane,Propylene, Ammonia Sulphuric Acid, Diesel, Petrol, Road Tankers & Storage Approved By Chief Controller Of Explosives, Nagpur.